Lying in central Viet Nam, about 103km from Phan Thiet city, Phu Quy district is an ideal tourist destination for holiday-makers as it houses 10 small islands, with Phu Quy Island being the biggest in pristine condition. Every day there is a ship leaving the port in Phan Thiet city to bring locals and visitors from the mainland to Phu Quy, with fares costing between VND150,000-200,000 each. There is also a high speed boat to the island, and the service cuts the travel time by half, just two hours, with fares costing around VND330,000. Phu Quy is famous for its natural beauty and tasty foods. Despite the long voyage, the tour of Phu Quy and nearby islands still attracts many visitors as a Vietnamese saying goes “High mountains can’t barrier lovers”. The island district has a total area of 32sq.km. It has an abundant source of seafood, making its Binh Thuan province the second largest fishing area in Viet Nam. Phu Quy is like a generous host that would try to compensate for visitors after a long journey. Its foods are fresh, tasty, cheap and weird. They include “Moon crabs” that have red spots on the back, and “King crabs” that have a better quality than in other areas. The district also offers steamed or grilled lobsters that can make a visitor’s tongue really “numb”. There is a buffet from snails which are soft, sweet, and fat. Fish buffet is another feast that eaters can’t forget, with enough boiled, grilled, fried, steamed fish, cooked porridge, fish soup, and fish rolls which are always extremely tasty. Visitors would be surprised by the wealth of the islands. All the roads are wide and asphalted. Basaltic soil makes fruit trees luxuriant, including the mango and guava that have sweet tastes thanks to the climate and soil characteristics. “Anything in Phu Quy is fresh and surprisingly cheap, from seafood to fruits and meals,” says Nguyen Lam Anh, a visitor from HCM City, adding that it is a real joy to rent a motorbike to tour around the island. “We should also get up early to catch the sunrise and wait for the fishing boats to come back. You may feel blackouts with all sorts of sea produce,” he confides. Some visitors have fun going on a boat to floating houses to learn how to feed fish and crabs, and have lunch there. Another destination in the district is Linh Quang pagoda, built in 1747 with the sacred ancient Buddhist statues. Van An Thanh Temple was built in 1781 to worship Nam Hai (East Sea) Spirit and exhibit a 20m-long whale skeleton. The Cao Cat Mountain at the altitude of nearly 100m, with Linh Son Pagoda erected on its top, and the giant boulders cliff is an ideal spot to contemplate the panorama of the islands. The beaches on the island are very beautiful and clean as they are far from residential areas. Despite no big hotels, there are decent rest houses, and local people are friendly, Lam Anh remarks. Tran Ngoc Can, an official from the island district, says Phu Quy is wild and attractive, but local tourism is yet to develop because of poor traffic conditions. “According to our tourism development plan from now till 2015, with a vision for 2020, the island district will boost tourism as a key economic sector. To do this, we are calling for investment to upgrade infrastructure and build more transport ships,” he says. But many visitors are happy to explore wild nature on the island. 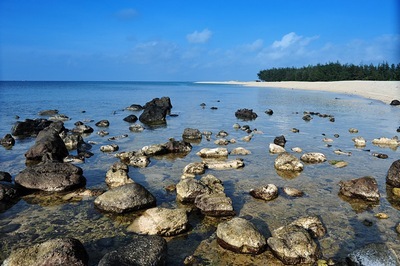 “We visit the islands to wash lungs and eyes, and more importantly to get rid of trouble from city life,” says Lam Anh.